I recently made what turned out to be a nine-day painting trip through southern Utah. 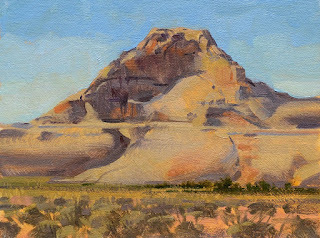 I did my best to get a few of my painting friends from New Mexico to join me but with no luck, so I took off on my own. 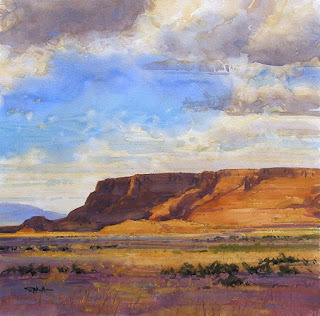 My plan was to begin at Boulder Mountain just west of Capitol Reef National Park, then on to Bluff Utah, Monument Valley, Page Arizona and Marble Canyon. There are a few small natural lakes high up on Boulder Mountain just below the rimrock which I thought might make for good painting this time of year. By sunset on day one I drove within 3 miles of the trailhead to these lakes and made camp for the night. The next morning I drove on to the trailhead, grabbed camera and sketching gear and headed out for a one-mile hike. After what turned out to be a difficult hike trudging through snow drifts on the trail I finally arrived at the lake. Much to my surprise the lake was fully frozen over. I expected part of the lake to be covered in ice but since this year's spring weather has been so warm, I thought it would be at least partly thawed. 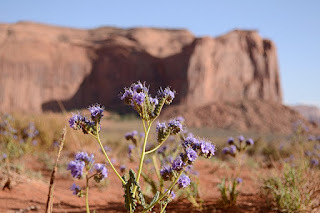 I took a few pictures, rested a while, then headed back to the van and on to Capitol Reef. This kind of painting trip, for me, is done without a set itinerary. The idea is to know you’ll be out from one to two weeks. If the weather turns bad or the paintings don't go well, you move on. If all goes well, you stay put and continue painting. 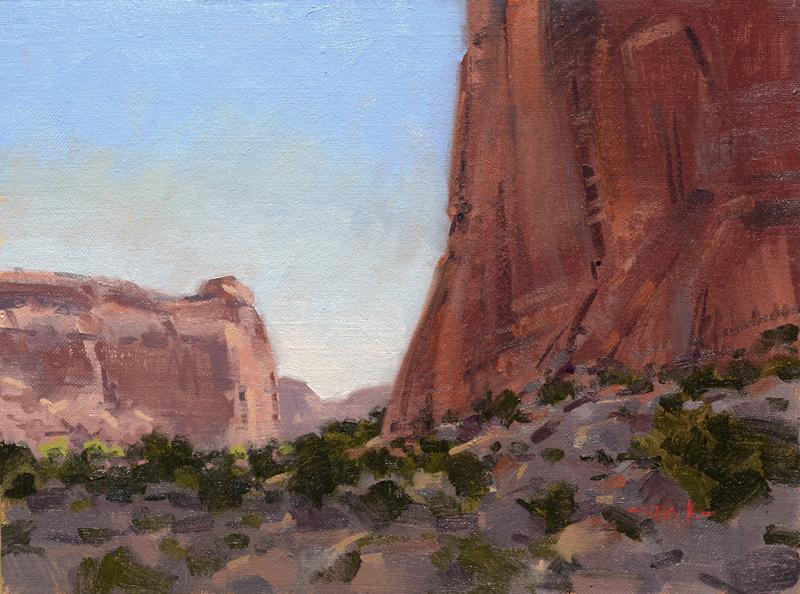 Arriving in Capitol Reef, I knew I would stay at least two nights but ended up staying three. The campground at Capitol Reef is first-come, first-serve, unlike most National Parks that require reservations, in some cases a year ahead. This policy makes it hard to take a spontaneous painting trip based on many things, including good weather. I like to jump in the van and go when the conditions look right. 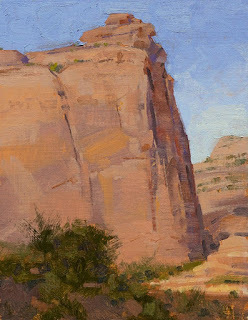 For me painting on location (plein air) is a bit like fishing, sometimes you get a keeper and sometimes you have to throw them back. The keepers I got from my three days in Capitol Reef can be seen below. After a few days of painting in Capital Reef the weather was beginning to close in and rain was threatening. I used the bad weather as a travel day and made my way to Bluff, Utah where I stayed at the Sand Island campground. Sand Island is where all the river runners spend the night getting ready to launch the next morning on a 10 day San Juan River float trip. I had no trouble getting a great little private campsite for two nights. 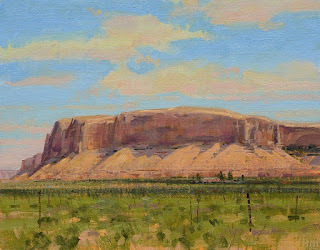 The paintings completed from the Bluff, Utah area are below. Summer Sky over Bluff, wc – 22x22” Painted in the studio after returning home. From Bluff I made my way south toward Monument Valley but not before stopping at the Gooseneck Overlook State Park. This is a location where you can see how the San Juan River twists and turns slowly making its way to the east end of Lake Mead. 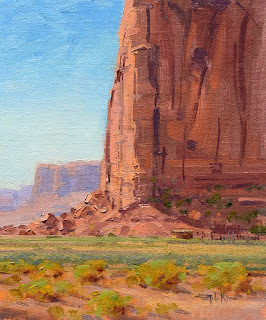 Arriving in Monument Valley I was very surprised to learn that the Navajo tribe had closed the primitive campground. The only way to camp at Monument Valley now is to drive 5 miles west and stay at the Goulding's RV Park. 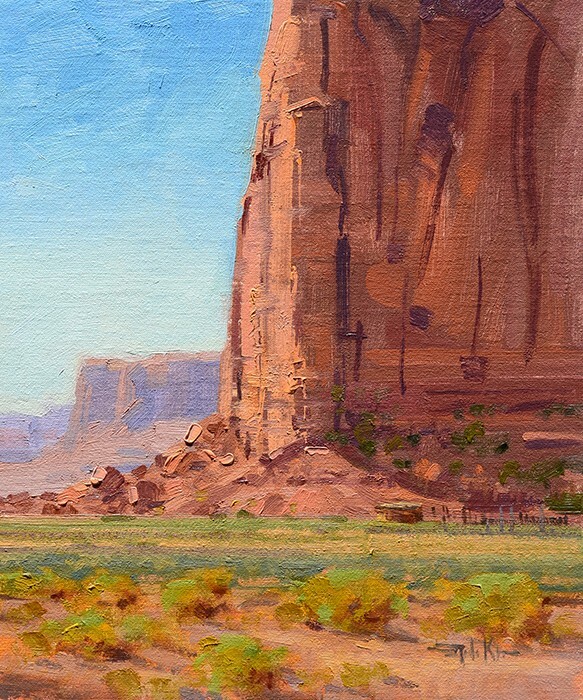 Don't get me wrong, Goulding's is a very nice park but for more than 30 years I’ve been visiting Monument Valley and staying at the primitive campground overlooking the valley. I've heard it said before that the only constant in the world is change but this is one change I was not glad to see. Monument Valley now has a highfalutin’ hotel at the valley’s overlook and the rooms have to be reserved at least three or four months ahead at a cost of between $200 and $250 a night. 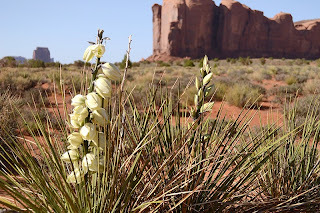 It isn't going to be easy to make quick trips to Monument Valley and stay without making plans well ahead of time. 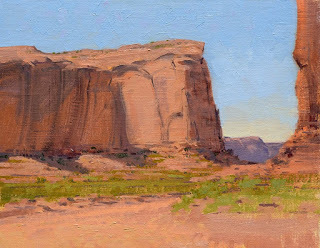 I drove down into Monument Valley, picked out a painting spot and got to work. Later I drove around, took a lot of pictures and waited for the sun to slowly set. As I pulled into Goulding's RV campground it was obvious the place was packed. As I suspected, not one RV space was available, however the clerk said there was one tent site left. My lucky day. I said I'll take it. The next morning I got up early and made my way into the valley for the entire day. The paintings completed from my time in Monument Valley can be seen below. I don't know what these flowers were, but they were all over the valley. The yuccas were in bloom everwhere you looked, great time of year to visit here. Page, Arizona is not far from Monument Valley, perhaps only a couple of hours driving time. Even though the sun was setting I decided to drive on to Page where I spent the night in the Walmart parking lot. The next morning I did the small painting seen below of one of the many very unusual formations found in this area. The weather forecast was for increasing clouds and fairly strong winds. Marble Canyon is only two hours or less drive from Page. If it was going to be cloudy and windy I didn't want to miss getting photos of the area around Marble Canyon and Vermilion Cliffs. 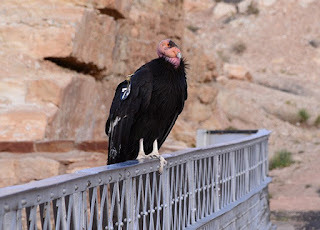 Approaching Navajo Bridge which crosses the Colorado River I noticed two California condors soaring above. I've seen them here before and was not surprised but I always stop to get photographs. As I was parking, one of these huge birds landed on the opposite side of the bridge. 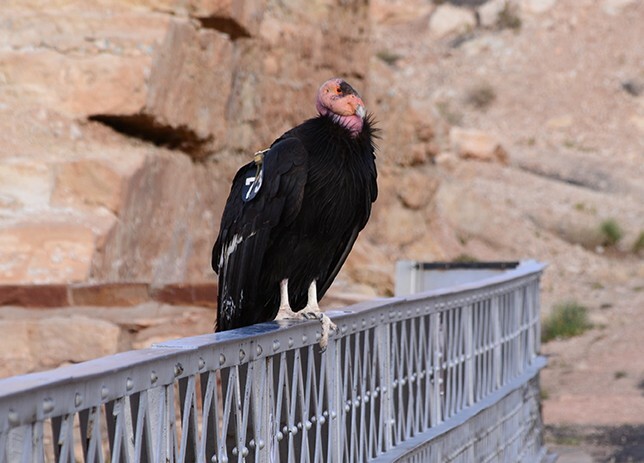 With camera ready I approached, wondering how close I might be able to get before condor number 73 would fly away. I was surprised but very pleased when the bird did not fly away at all. In fact it let me stand six or seven feet away and take as many photos as I wanted. I may have to do some paintings of these odd looking creatures. The weather continued to worsen and the light was not conducive to painting. 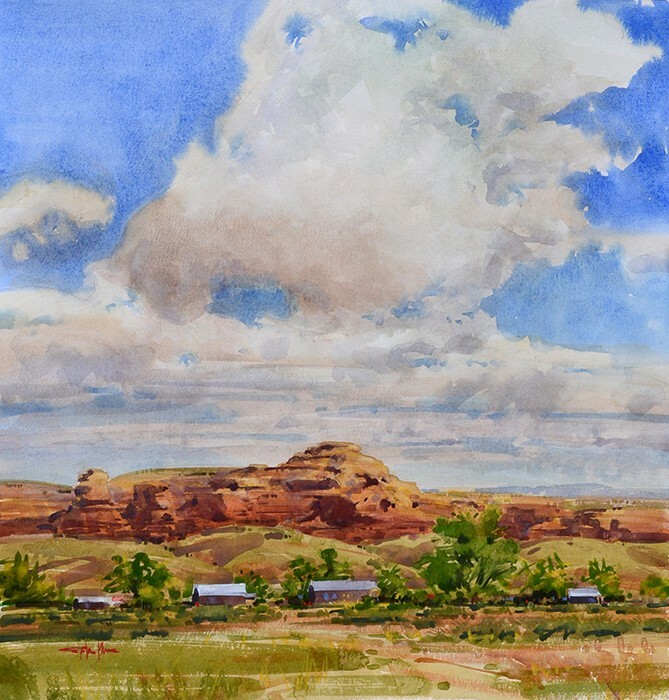 This watercolor was completed in the studio after returning home.